With Easter right around the corner, mobile game developer and publisher Game Insight has announced a variety of Easter-themed content updates across its many games on iOS, Android and Facebook. From Mystery Manor to The Tribez, fans of Game Insight’s titles have lots to keep them busy this Easter season. In 2020: My Country, for instance, players can meet the Easter Bunny, who has bounced into town to help them prepare “special surprises” for their town’s residents through new quests. 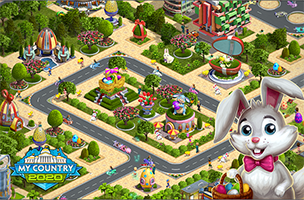 The city-building game offers more than 20 themed decorations and buildings, including Easter Eggs, Spring flower beds, cake shops and Willow Catkins plants. Meanwhile, Mystery Manor players are challenged with collecting parts of a Faberge charm. Players can interact with the game’s Easter Bunny to find these parts, or earn them from friends as gifts. Of course, players are also encouraged to find charm parts by completing the game’s hidden object scenes. Finally, Airport City players will spot furry bunnies hopping around their towns. Players can now build Farmers Markets to provide their residents with organic food, or collect Easter Eggs before the event ends. Other Game Insight titles are also holding Easter-themed events, including Big Business Deluxe, Hidden Land, Hotel Enigma, Incredible Heist, Mirrors of Albion, Paradise Island, Smiley Boom, Sunshine Bay and The Tribez. These events will run through April 30. Check back soon to follow all of Game Insight’s titles on AppData, our tracking service for mobile and social apps and developers.